If you’re looking to fly in pure luxury and comfort, there’s almost no better destination than Dubai. 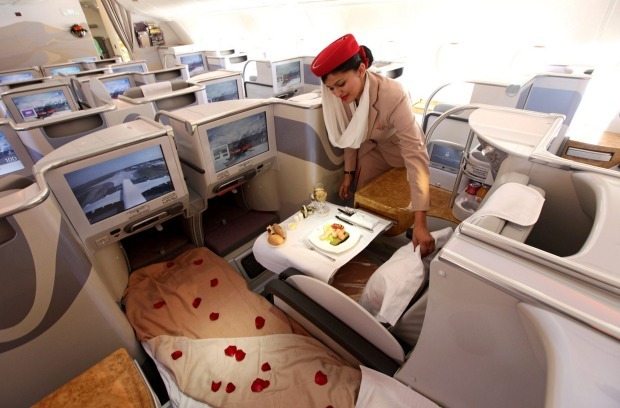 This is thanks to airlines like Emirates, which offers some of the best “upper class” airline products in the world. Whether you’re flying from Calgary, Vancouver, or Toronto, there are plenty of options for getting to Dubai in style. Alaska Airlines Mileage Plan: While Alaska Mileage Plan miles aren’t as easy to earn as Aeroplan miles, they do offer the best bang for your buck (actually, points) in terms of business class and first class options. To earn Alaska Mileage Plan miles, you’ll want to get the MBNA Alaska Airlines Mastercard. Thanks to partners like Emirates as well as generous reward options like multiple stopovers, the Alaska Mileage Plan is a great program to be a part of if you’re looking for business class flights around the world. Air Canada’s Aeroplan: When it comes to Dubai, Aeroplan offers a variety of airlines with business class flights, although none of them can compete with the luxuriousness of Emirates. Options include United Airlines, Lufthansa, EgyptAir, Air Canada, and Turkish Airlines, to name a few. The one thing you’ll have to watch out for is high taxes and fuel surcharges. Some of the airlines that are affiliated with the Star Alliance (Aeroplan) that don’t charge fuel surcharges include Brussels Airlines, EgyptAir, Turkish Airlines, and United Airlines. One of the best cards for earning Aeroplan points is the TD Aeroplan Infinite Visa. Your best options with Aeroplan would be Turkish Airlines and United Airlines. American Express Rewards: Although booking flights directly through Amex is not great value, you can transfer to a variety of partners including Aeroplan, British Avios, Delta, Asia Miles, and Etihad. Before doing so, I’d recommend checking availability to make sure the flight you want is available and then check how long the transfer takes. For Aeroplan, it usually takes one day or less and the transfer ratio is 1 for 1. The best card to get started with American Express Rewards points is the American Express Gold Rewards card. RBC Avion: Although Avion points would not be good for business class flights, they can be transferred 1 for 1 with British Avios, Cathay Pacific, and AAdvantage. For going to Dubai, your best option here would be transferring your Avion points to AAdvantage and then redeeming for a flight on Etihad. If you want to experience the best possible business class flight to Dubai, look no further than Emirates. 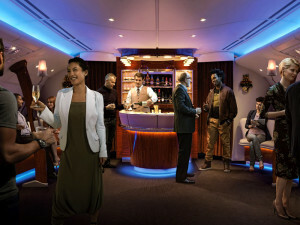 As a partner of Alaska Airlines, Emirates provides a fantastic business class experience and if you have additional points, you can enjoy one of the best first class experiences in the world, including an onboard shower spa and a private suite. One of the other cool perks of flying Emirates in business class or first class is the onboard lounge. You can literally enjoy top quality drinks while mingling with other passengers in your pajamas. Another big benefit is that many flights are non-stop! If Emirates is not in the cards, the next best option is probably Etihad Airways, which also offers an excellent business class product. To book an award, you could either transfer your Amex points over to Etihad directly or you could transfer them from British Avios to AAdvantage and book through them. Etihad’s reward booking platform is known to be complicated so I’d go with AAdvantage if possible. However, you’ll definitely want to call AAdvantage first and make sure there’s availability. The third best option is Air Canada’s Aeroplan. Because of the vast network of the Star Alliance, there are many options for flying business class to Dubai. The best options are likely to be United Airlines, Turkish Airlines, EgyptAir, and Ethiopian Airlines. All four airlines offer a decent business class experience and don’t charge a fuel surcharge. I’ve personally flown first class with Ethiopian and it was amazing. EgyptAir offers full lie-down business class seats. Turkish Airlines offers great food and a wonderful lounge in Istanbul. United Airlines has a good business class product as well but tends to lack availability. There’s no question that Emirates wins for luxury and convenience. However, you need to earn miles solely through Alaska Airlines, which can be difficult depending on your spending habits. However, the cost of the flight is the same as a business class flight through Aeroplan, which is 165,000 miles return. You’ll get better value booking Emirates through Alaska but if you find Aeroplan easier to earn, there’s plenty of good options as well. Dubai: Since you’re flying to Dubai for business, you should enjoy the wonderful lounges available at the airport. Some of the nicest lounges include the Emirates Business Class Lounge and the Emirates First Class Lounge. The Business Class Lounge includes an exclusive champagne tasting area, high-quality food, and a dedicated quiet area for relaxing. The First Class Lounge includes an international menu, shower spas, a cigar bar, as well as direct boarding. These lounges are so nice that you’re going to want added time at the airport just to enjoy the incredible food and amenities. Istanbul: If you end up flying with Turkish Airlines, you’ll get a free stopover (or connection) in Istanbul, which is home to one of the nicest airport lounges in the world. The Turkish Airlines Lounge is massive and includes a huge array of delicious food, an open bar, a cappuccino bar with Turkish delight, storage for luggage, and even a movie room if you want to kick back and watch the big screen. The first step is deciding on the award program you’d like to use. I’d recommend the Alaska Mileage Plan first followed by Aeroplan. All you need to do is log into your rewards program and do a flight search. If you can’t find the desired flight or if you’re having any difficulties, phone the call centre. An agent might be able to help and for a fee of $35 or less, it could save you a lot of stress. Another option would be to use our award booking service, which is great if you want to add in multiple stopovers or get maximum value for your points and miles. Don't subscribe All Replies to my comments Notify me of followup comments via e-mail. You can also <a href='https://www.creditwalk.ca/comment-subscriptions/?srp=5030&srk=2648578ecea05c83754707575dc5a494&sra=s&srsrc=f'>subscribe</a> without commenting.